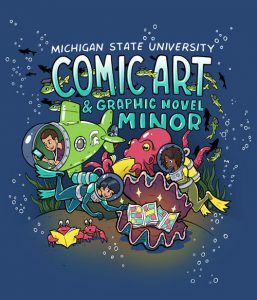 Michigan State University is home of the interdisciplinary program of study, the Comic Art and Graphic Novel Minor, where students take courses in both Art and English Departments. Minor participants also have the ability to customize their path of study with the fifth and final class choice in order to tailor their experience to a more art or literature focused experience. Full outline listed here. The Comic Art Collection in the Michigan State University Special Collections Library is the largest public collection of comics in the world and holds over 300,000 items. Items included are American comic books, collected newspaper comic strips, nearly 45,000 foreign comic books, and several thousand books and periodicals about comics. Although some archival materials are held, the focus of the collection is on published work. 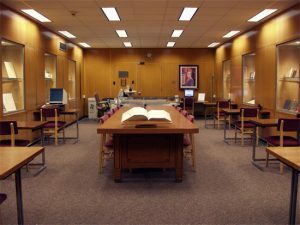 The Special Collections Library is open to the public. See website for more information. Michigan State University also hosts the award-nominated Comic Art and Graphic Novel Podcast. Each episode consists of 3 segments, starting with updates and news items about comics-related events in and around Michigan State University, followed by a brief discussion with MSU Special Collections Comics Bibliographer, Randy Scott, who has built the largest public collection of comics in the world, which is housed in the Main Library of Michigan State University. The third segment is an in-depth interview with an award-winning cartoonist. New podcast episodes are released monthly throughout the academic year (Sept – May). Listen at msucomics.libsyn.com or on any podcatcher service. 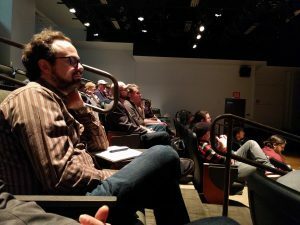 The Michigan State University Comics Forum is a multi-day, annual event for scholars, creators and fans of the comics medium. 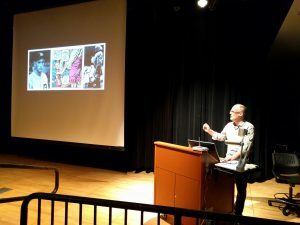 Events include keynote addresses from an award-winning creator and scholar in the field, an artist alley, academic panel discussions, exhibition of comic art, comic book discussion groups and more. 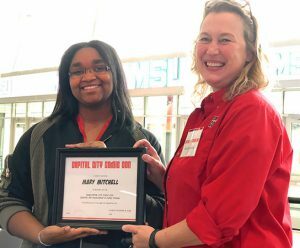 Michigan State University partners with the Capital City Comic-Con, a Lansing, MI based comic convention which annually awards a $1,000 scholarship to a deserving MSU Comics Studies student. 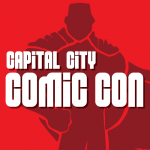 The Capital City Comic-Con was established in 2015.